SOF News Update 20181203 – Airpower stats for AFCENT, SECDEF gaggle, Australian cyber warfare, video on history of the Pentagon, A-29s for Nigeria, review of Jack Ryan, giving back to the Ranger community, Iran rockets Taliban, lone wolf terrorism, Chinooks for UK SOF, SFC Emonds, and more. SF Vietnam Vet Returns to the Past. Richard Rice visits the old stomping grounds of a distant war. Read “Unpacking the War: A Soldier Returns to Vietnam”, Military.com, November 30, 2018. Chinooks for UK SOF. British special operations forces will soon have 16 more Ch-47 Chinook transport helicopters. See “Special Operations: British Operators Get the Right Ride”, Strategy Page, November 30, 2018. SOF and Mindfulness Training. A study followed 120 SOF operators for two months to see whether mindfulness training could help improve their attention and working memory. Read “The best prospect for ensuring success in demanding roles”, University of Miami News, November 30, 2018. Psychological Warfare During the Cold War. Read about the U.S.’s first formal peacetime campaign of propaganda and manipulation in “Project Troy: How Scientists Helped Refine Cold War Psychological Warfare”, The Atlantic, December 1, 2018. Remembering SFC Emonds. A fallen Green Beret that hailed from Massachusetts is remembered. See “Bay State loses a Patriot”, The Boston Herald, November 30, 2018. Giving Back to the Ranger Community. Former and current Army Rangers gathered in New York City to attend the Army Ranger Lead the Way Fund gala held to raise money to assist the Ranger community. (The Freq, Nov 28, 2018). The US is pushing hard for a negotiated agreement with the Taliban. He sees momentum picking up. Troops on border. DoD will respond to any further requests from the Department of Homeland Security for border support. There could be troops on the border through Xmas. Primary troops task is supporting with logistics and putting up barriers. Khashoggi murder: No smoking gun pointing to direct involvement of Saudi Arabia’s crown prince. SECDEF on National Defense Strategy. Jim Mattis addressed an audience at the Ronald Reagan Presidential Foundation and Institute and answered some questions Fox News’ Brett Baier. (DoD, Dec 1, 2018). Keeping Secrets in an Age of Technology. The use of social media, the internet, and other technological advances make it more difficult to keep military operations secret. See “The Days of Secret Military Operations May Soon Be Over. Does That Matter?”, Military.com, December 1, 2018. Women in Combat by Country. The De Faakto Intelligence Research Observatory has penned a fact sheet on women who have or do serve in combat by country. Read “Women in Combat: An Open Source Backgrounder”, Small Wars Journal, December 2, 2018. Social Media – Can U.S. Military Adapt? Steven Metz, author and nat sec commentator, writes on the need for the U.S. military to get on the social media bandwagon in “Social Media Has Democratized Psychological Warfare. Can the U.S. Military Adapt?”, World Politics Review, November 16, 2018. Tucano’s for Nigeria. The U.S. DoD has placed a $329 million contract for the manufacture of 12 A-29 Super Tucano aircraft for the Nigerian Air Force (NAF). The contract is expected to be completed in 2024. Sounds like a case of ‘too little too late’. So in six years the Nigerians will have twelve Tucanos. The A-29 is a single propeller aircraft. From 1941 to 1945 the U.S. produced over 300,000 planes. One would think we could do a little bit better on the timeline for the A-29s. The U.S. has a history of plodding along when it comes to providing aircraft to our security partners. Just look at attempts to provide the A-29 to the Afghan Air Force – a case study on the ‘slow roll’. Countering Hybrid Threats. The North Atlantic Treaty Organization is working hard to develop the capacity and capability of dealing with a multitude of hybrid threats. Of course, the threat comes from the Russians – no secret there. Read more in “Cooperating to counter hybrid threats”, NATO Review Magazine, November 23, 2018. And . . . Counter-Hybrid Warfare. Gary Anderson, a retired Marine Colonel, former civilian advisor in Iraq and Afghanistan, and an adjunct professor at the George Washington University’s Elliott School of International Affairs, writes about “Counter-Hybrid Warfare: Winning in the Gray Zone”, Small Wars Journal, December 2, 2018. Hoffman on ‘Gray Zone’. A very detailed paper by Dr. Frank Hoffman, a Distinguished Fellow at National Defense University, provides us with a good account of hybrid warfare. Read “Examining Complex Forms of Conflict: Gray Zone and Hybrid Challenges”, PRISM, Volume 7, no. 4, National Defense University, November 8, 2018. Lone Wolf Terrorism. Jeffry Connor and Carol Rollie Flynn take a look at the phenomenon of lone wolf terrorism and advocate for greater investments in primary and secondary prevention. Read “What To Do About Lone Wolf Terrorism? Examining Current Trends and Prevention Strategies”, Foreign Policy Research Institute (FPRI), November 2018. Australian Army Journal. A special edition of the Australian Army Journal has been published that provides insights into how the Australian Army might understand and deal with cyber warfare in the virtual battlespace. (Nov 2018). Air Force Magazine. The December 2018 issue is now available. Several interesting articles to include “Special Treatment for Special Warriors”. Review of Jack Ryan. Amazon Prime’s show featuring the hero of Tom Clancy’s novels is getting good reviews. I have only watched the premiere (first show) and enjoyed it. Read “Jack Ryan: An idealist in an unidealistic world”, The Freq, November 29, 2018. Video – History of the Pentagon. Watch an interesting and informative documentary about the Pentagon – starting from its establishment in late 1941 (when construction began) to the present day. Video by Honey Shewbert, DoD, November 29, 2018, 29 minutes. Posted on DVIDS. 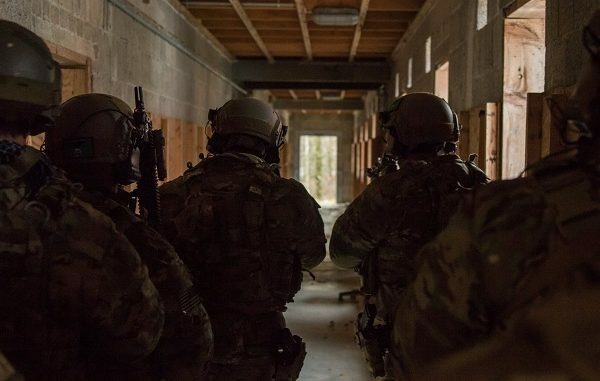 Photo: SOF Operators conduct CQB. Photo by Sgt. Matthew Britton, USSOCOM, September 22, 2018.